Every scene in this artful, indulgent thriller is expertly acted and staged, although at least an hour of sideroads and spurious moments could have been cut from the film without changing its impact. 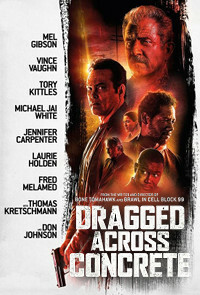 Filmmaker S Craig Zahler wouldn't even have to abandon his snaky, detailed pacing. Another of Zahler's bracing genre reinventions, this time a police thriller, the film is superbly played to a heightened style. So even if it's achingly slow, it's still riveting. Suspended for using excessive force, detectives Brett and Anthony (Gibson and Vaughn) are worried about their future: Brett has a disabled wife (Holden) and endangered daughter (Olson), while Anthony wants to marry his girlfriend (Jones). Passed over for promotion because he always played it straight, Brett decides that he's going to rob the crime boss Vogelmann (Kretschmann). So he and Anthony start tailing Vogelman's crew, including two hired-in drivers (Kittles and White). And they walk right into a grisly bank robbery that leads into a long and very nasty stand-off. Zahler painstakingly fills in details about each central character, plus a few side ones like Carpenter's bank teller. This means that the film is constantly spinning off to unexpected subplots, which take their time before returning the audience to the main narrative. While this adds layers of interest, it unnecessarily lengthens the film and adds a rather sadistic emotional angle to each moment of hyper-violence that comes along. Sequences are skilfully shot and acted, but each moment feels contrived to shock. The cast members have a lot of fun with these detailed characters, playing scenes with a heightened sense of sardonic glee that adds humour and depth at every turn. Gibson and Vaughn are a superb double act, while Kittles anchors the film with a notably intelligent, engaging performance. Because of the storytelling style, even the smallest side roles offer the actors a chance to add some meaning to the film. This includes particularly terrific cameos for Carpenter, Johnson and Melamed. So while there's not much to the basic narrative, the spiralling character strands and snaky through-line are enjoyable enough to hold the attention. Zahler's obsession with insanely gruesome death is hard to stomach in a couple of sequences, especially since he has worked so painstakingly to hook the audience into each ill-fated character's story. It's rare to see a film that so viscerally violates the audience's trust, and perhaps that's what makes Zahler's storytelling so exhilarating.